Discuss the view that health inequalities can be explained by lifestyle choices made by different social groups. During the last century the general consensus in the western world has regarded medical advancement as the main reason for improvements in society’s health. This media fuelled conception has led the public to believe that we are able to ‘control’ the human body and can predict mortality with healthy choices adopted from scientific research which in turn improve your lifespan. 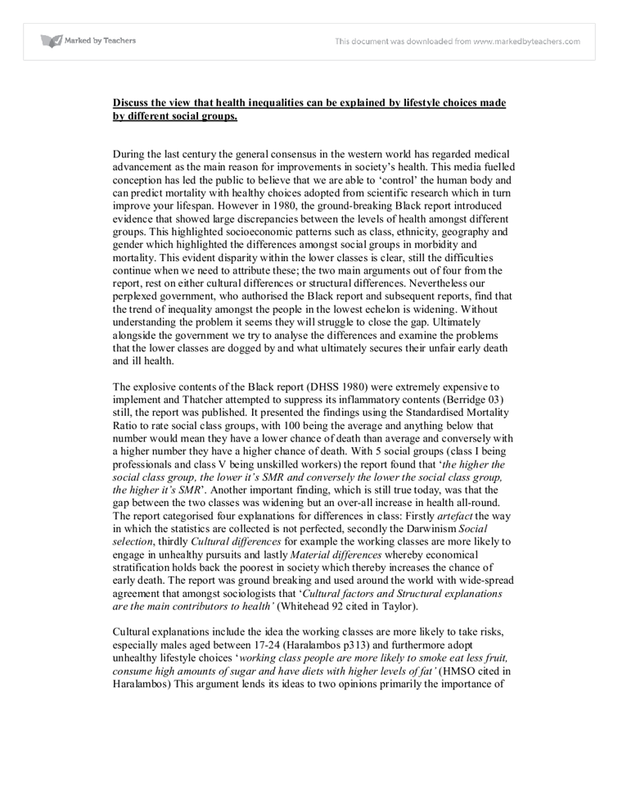 However in 1980, the ground-breaking Black report introduced evidence that showed large discrepancies between the levels of health amongst different groups. This highlighted socioeconomic patterns such as class, ethnicity, geography and gender which highlighted the differences amongst social groups in morbidity and mortality. This evident disparity within the lower classes is clear, still the difficulties continue when we need to attribute these; the two main arguments out of four from the report, rest on either cultural differences or structural differences. Nevertheless our perplexed government, who authorised the Black report and subsequent reports, find that the trend of inequality amongst the people in the lowest echelon is widening. Without understanding the problem it seems they will struggle to close the gap. Ultimately alongside the government we try to analyse the differences and examine the problems that the lower classes are dogged by and what ultimately secures their unfair early death and ill health. The explosive contents of the Black report (DHSS 1980) were extremely expensive to implement and Thatcher attempted to suppress its inflammatory contents (Berridge 03) still, the report was published. It presented the findings using the Standardised Mortality Ratio to rate social class groups, with 100 being the average and anything below that number would mean they have a lower chance of death than average and conversely with a higher number they have a higher chance of death. With 5 social groups (class I being professionals and class V being unskilled workers) the report found that ‘the higher the social class group, the lower it’s SMR and conversely the lower the social class group, the higher it’s SMR’. Another important finding, which is still true today, was that the gap between the two classes was widening but an over-all increase in health all-round. The report categorised four explanations for differences in class: Firstly artefact the way in which the statistics are collected is not perfected, secondly the Darwinism Social selection, thirdly Cultural differences for example the working classes are more likely to engage in unhealthy pursuits and lastly Material differences whereby economical stratification holds back the poorest in society which thereby increases the chance of early death. 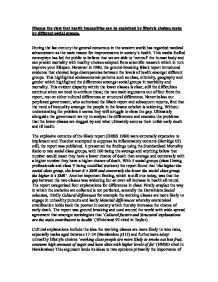 The report was ground breaking and used around the world with wide-spread agreement that amongst sociologists that ‘Cultural factors and Structural explanations are the main contributors to health’ (Whitehead 92 cited in Taylor). Cultural explanations include the idea the working classes are more likely to take risks, especially males aged between 17-24 (Haralambos p313) and furthermore adopt unhealthy lifestyle choices ‘working class people are more likely to smoke eat less fruit, consume high amounts of sugar and have diets with higher levels of fat’ (HMSO cited in Haralambos) This argument lends its ideas to two opinions primarily the importance of individual’s lifestyles on health on the other hand that there are many behaviours imbedded in the social culture of class and not under control of the individual. Some government policies show an example of this way of thinking, the Welfare Food initially founded in 1940 was introduced to support low-income families by providing milk and has recently introduced the Healthy Start Scheme (2006) that has several aims including To use the resources of the WFS more effectively to ensure that children in poverty have access to a ‘‘healthy’’ diet and to provide increased support for breastfeeding and parenting (NHS Plan, 2000). This intervention by the state on people’s diet with such campaigns often influences the individual’s lifestyle choices and directly change the way of thinking within the class. However the structural explanations offer a different explanation, paying less attention to individual choice, and focusing on the socio-economics often responsible for restricting options and choices. The Structural explanation often termed ‘life circumstances’ include both social and material conditions covering differences in income, shelter, work, access to services, and physical and social threats from their environment. The studies conducted by the DHSS including the Black report and the later Acheson report, have found stark disparities with a strong correlation that material deprivation, poor housing and over-crowding are often found in low-income neighborhoods result in higher rates of disease. Haraleambos explains the theory ‘it claims that society is organized systematically disadvantages certain groups of people, so that they inevitably experience poor health’. Research into this area had been extensive for example the correlation between eating healthy foods is linked to the inability to purchase higher quality foods Morris (1989). This is backed up by a report whereby healthy food was more expensive in poorer pockets of London as opposed to more affluent areas (Lobstein 95). These links between health and the inequalities show an example of the barriers the working classes have to overcome to keep healthy however for some there are other obstacles to overcome. Paradoxically, although women live for longer than men surprisingly the statistics show that more women visit their doctors suffering from physical and mental disorders. Women are also more likely to suffer from iatrogenic medicine with particular emphasis on cardiovascular disease from the contraceptive pill. Still, the gender debate is normally assumed to be about female issues though we will look at the male viewpoint. Younger males from working class backgrounds are more likely to take risks (young 90) and are more likely to engage in ‘edgework’ showing a cultural lifestyle choice endangering life expectancy. On the other hand it seems that women suffered at the hands of the patriarchal society that they live in that ‘women often die because they are women (dowry deaths, domestic violence)’ (Freedman and Maine 93). Women are also more likely to make us of the health service and suffer ill health leaning to three explanations: firstly the biological reason that women suffer more health problems than men due to biological differences with men (Kane 91), secondly that women are isolated in domestic work therefore more susceptible to depression (Brown and Harris 1978) and that thirdly women lead healthier lifestyles for example don’t drink as much alcohol as men. Working class women also make less use of the health services than middle class women and with that is the tendency to blame the working class women for not perceiving the benefit of the services offered but maybe it is that working class women find it difficult to talk to middle class professionals and are aware that the doctors remit doesn’t include improvements in housing, lack of money or other problems (Pill and Stott 86). Working class women alongside black women experience the greatest control from medical professionals often being forced into abortions and being prescribed long-term birth control. This emphasizes the double negative some groups are exposed to and backs up the structural standpoint that treatment even within the medical world leaves the poorest women with limited choices. The area of ethnicity has been for others a difficult area to analyze as the definition of race is different for each author of a study. However there have been several explanations offered firstly the genetic explanation whereby diseases such as sickle-cell anemia which are only inherited explain a few specific illnesses. The is a cultural perspective that highlights the rickets in Asian families and due to their diet lacking vitamin D but conversely the small intake of smokers amongst Asians. It remains clear that when we analysis women in ethnic minorities we see that they suffer far higher rates of poor housing with a strong concentration in deprived wards and lower wages. This would point us to believe that they are subject to other variables such as institutionalized racism and discrimination that the Lawrence inquiry has highlighted. Other studies of racisms had concluded that Asian women in Northern England regarded ‘social isolation, fear and frequency of racist attacks, and cold damp housing to be the main causes of the poor physical and mental health’ (Nettleton 93). There has been recent interest among sociologists on the role of health and social cohesion. Originally introduced by one of the founding fathers of sociology Durkheim in Anomie it has been developed further by Wilkinson (1996) whereby he argues that the healthiest counties are not the richest, but those who in which the income is most evenly distributed and levels are social integration are the highest. Such egalitarian societies as Japan and Sweden have a smaller divide between rich and poor as opposed to America. He argues further that this shows clearly that the income distribution undermines social cohesion. His work has been received with great response in that health inequalities lie surround the larger societal problem and that work needs to done on working together and not on the individual areas. On the other hand he has been criticized for not showing clear causal relationships between inequality and poor health (Judge 1995 cited in Giddens). Discuss the possible reasons for higher mortality and morbidity rates among the working classes. To which Social Groups did the Reformation appeal in Sixteenth-Century Germany and Why? Is working class underachievement better explained by factors inside or outside the school? Even with the same social origins and education of a white male, a black still has lesser chances of upward mobility, apparently as a result of discrimination. White Southerners, on the other hand, come from lower social origins than their Northern counterparts, and have less education but these effects are not cumulative. Since streaming is often linked to social class, being middle class gives a greater chance of being allocated to a top stream. Due to this stereotypical attitude coming from the teachers it contributes again to the underachievement of the working class. Paul Willis takes on a Neo-Marxist approach to education. Le Grand (1985) examined individual death certificates, and found smaller differences between the classes than Pamuk (1985) who collated the existing statistical evidence. The second explanation given for the inequalities identified by the two reports is social selection i.e. that social class status is related to an individual's health status. Moreover, women's position in society affects their health chances; women have the burden of childcare, which affects them both physically and mentally. Also, domestic labour, poor employment conditions because of gender discrimination, greater exposure to poor housing as a result of poor employment, greater exposure to poverty also as a result as poor employment. The only crime in which women predominate is prostitution. Other crimes not mentioned here are more equal between men and women, and although men still have the majority, the fact that women commit less crime than men should be taken into account.